The Royal Agricultural University (RAU) has been carrying out weeding trials at its Harnhill Manor Farm, near Cirencester, looking at the role of mechanical weeding. The replicated field trials have been designed to demonstrate weed control achieved by 4 different mechanical weeder options: Opico harrow comb weeder, Garford RoboCrop inter row hoe, TRP Rotanet and the Combcut weeder, which we are comparing with no mechanical weeding (control). Weeding treatments have been run either once or twice on a randomised split plot design so that a full statistical analysis could be conducted on the impact of weeders and number of weedings on weed growth and biomass and wheat growth and biomass. The experiment is a randomised block design with split plot arrangements replicated in 2 blocks (see March blog update below). The weeding treatments run the full length of a field (approx. 180m long), with assessments taking place in the middle 100m to avoid potentially compacted headlands. The main plot treatments each received one of the weeder treatments when conditions were appropriate in late March. The main weeder plots were then randomly split with half receiving a subsequent weeding treatment by the same machine approximately 3 or 4 weeks later. The RAU has teamed up with Innovative Farmers to bring ‘Mechanical Weeding LIVE’ on Tuesday 9 May 2017. The all-day event will give you a chance to see a range of mechanical weeders in action and hear about the details and results from the trials carried out. There will be a farm walk and an opportunity to meet machinery manufacturers. It will be held at the Rural Innovation Centre, Harnhill Manor Farm, Cirencester, Gloucestershire. The event plans to be fairly unique in attracting both organic and conventional farmers and encouraging open discussion of challenges, successes, failures, and opportunities to work towards improving the sustainability of arable agricultural systems. View the presentation Nicola gave at the event here. View the video 'Putting mechanical weeders through their paces' featuring RAU farms manager Tony Norris talking about the role of mechanical weeding here. Watch this video featuring Nicola introducing the site and the situation in January with regards to the weeds. Watch this video of Nicola showing the wheat (and describing the growth stage), showing weeds starting to grow, and describing the weather conditions. Watch this video featuring Tom Overbury, RAU farms director, describe the importance of rolling the findings out into conventional production systems, and emphasising that with increasing production costs, mechanical weeding can help reduce costs. Watch this video featuring Nicola describing the experimental randomised block design and how it will relate to the weed treatments and help establish which treatments performed better. Watch this video of Nicola describing some amendments they have had to make due to the weed burden getting extremely heavy (they have had to perform a first pre-treatment of weeding). 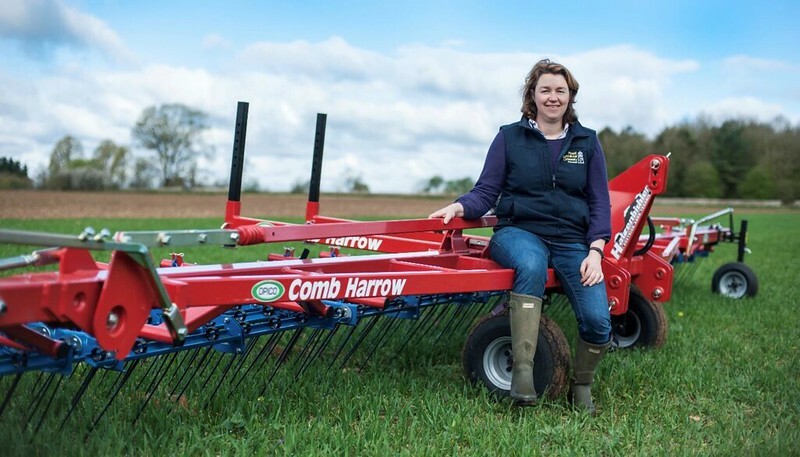 Watch this video of Nicola introducing the contrasts starting to emerge between different treatments in relation to both crop and weed growth due to the amount of rain that has fallen. Watch this video of Nicola looking at charlock and poppies in one of the wheat fields and the impact on weed burden. She explains that any weed competition will be particularly influencing light, nutrient and water uptake of the wheat and yields will be affected. Watch this video of Nicola standing in a completely un-weeded treatment and showing the weeds that are evident. She explains that very low wheat yields would be expected due to the high weed burden - it is an unacceptable level of weeds for a commercial organic crop, and shows how relevant it has been to carry out the weeding treatments. Click here to access other mechanical weeding videos diaries and other RAU videos of potential interest. Dr Nicola Cannon is Principal Lecturer in Agronomy at the Royal Agricultural University, Cirencester. View her profile here.